A career with Frazer-Nash will open up exciting new opportunities for you. You willl get the chance to work with people who are passionate about what they do. The selection process lets us learn more about you, what drives you, what you are passionate about, what you would like to get out of an ideal career. It also gives you the opportunity to find out more about Frazer-Nash - is it somewhere you would like to work, what areas you'd like to work in, what benefits it can offer you. You can visit our contact us page to find out where we are located. The following gives you an overview of what happens once your application has been submitted. We assess all the applications against specific criteria to see how closely applicants' skills, experience and qualifications are suited to the business needs. We will then short list those who we feel could be a good match for Frazer-Nash. If you are short listed you will then be invited for interview. We will reimburse any reasonable travel expenses incurred when attending your interview(s). If you are unsuccessful at this stage we will notify you. 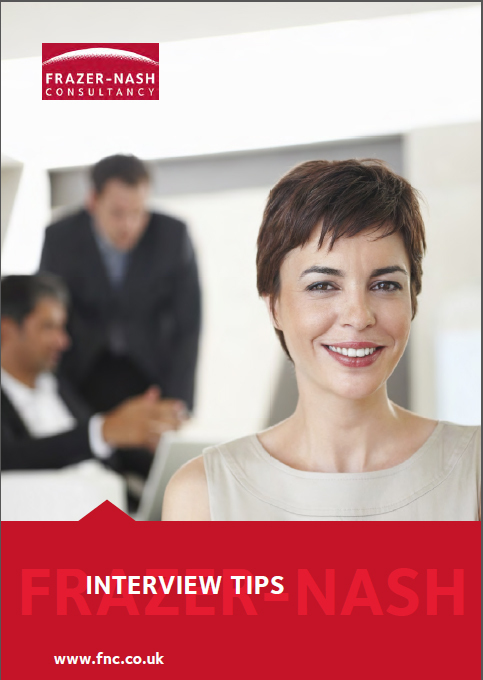 We hold a two stage interview process, usually conducted by two or more Frazer-Nash employees. This is how we get to know more about you, your background and your career aspirations. We also consider aspects like your business acumen, how you are at problem solving, if you have good commercial insight, how you respond to challenging situations, if you are a creative or a logical thinker. Now's the time you can find out more about the company and the job itself - would this be the right career move for you? This process will ensure that the role you are applying is well suited to you and one that you'd enjoy. What to bring: When you come for your first interview you will need to bring your passport for identification and a utility bill or drivers licence to confirm your current address. You will also be asked to bring your qualification certificates. We will assess all applicants' first interviews and will then select those that we feel are more suitable for the role; invitations will be issued for the second interview and may be held in a different office to the first one. This interview allows us to discuss the opportunities available in more detail, who you might be working with and the type of work you may get involved in. After the second interview we will review all the information, and if successful we will contact you with a formal offer of employment. This offer will be subject to appropriate security clearance due to the nature of our work, and receipt of satisfactory references. To accept the position you will need to sign and return the offer documentation to us within two weeks. If unsuccessful we will notify you and we are always willing to give feedback to unsuccessful candidates. Don't be discouraged and keep an eye on our website for other suitable vacancies to apply for. We wish you every success for the future.